Medical redshirt in 2011, looks like he had Tommy John surgery. Born in NJ, went to Vandy, 5th year senior. Great player. Saw him pitch these past two years. He has endless talent. He could be a steal for the Rays here in the 10th round. 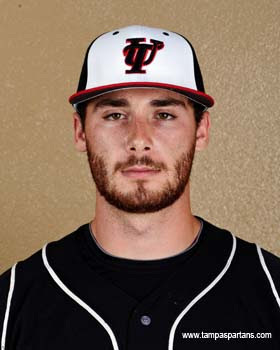  As a fifth-year senior at University of Tampa, was named the Sunshine State Conference Pitcher of the Year after going 8-3 with a 2.27 ERA, 85 strikeouts and 11 walks.  Named the American Baseball Coaches Association (ABCA)/Rawlings South Region Pitcher of the Year and Daktronics South Region Pitcher of the Year.  Sat out the 2010 season due to Tommy John surgery.  Pitched for Vanderbilt University as a freshman in 2008 and sat out the 2009 season after transferring.  Drafted in the 42nd round by the Cincinnati Reds in the 2007 June Draft.  Was a four-year letter winner in both baseball and soccer at Kinnelon High School.  His favorite athletes include Andy Pettitte and Lebron James. not a dbag. went to high school with him. nice kid, lots of talent.